Semiosis (2018. 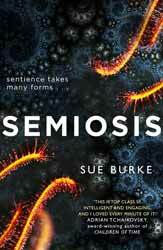 325 pages) is the impressive first science fiction novel by Sue Burke. The book covers the first one hundred and seven years of the colony’s existence covering the first seven generations. Each of the chapters uses an episodic multi-generational structure not unlike Asimov’s Foundation series. Each is told from a specific point of view and many are delineated by the new crisis which each generation faces. Pax can be a harsh and unforgiving world and Burke is not so attached to any of her characters not to kill them off. The colonists very quickly discover that the plant life is sentient to varying degrees. Some view this as a way of coexisting with the planet's ecology while others distrust the motives of intelligences with whom they cannot communicate. Having suffered losses of both individuals and vital equipment they have no choice but to work with the plants, but are they coexisting or are they prisoners? The initial part of the book examines how the first generation, for all their desire to create an Eden, become increasingly insular, having to exist in an almost primitive hand-to-mouth existence. Their fight for survival blinds them to the possibilities a future in their new world. Held back by the fears and prejudices they have brought from Earth it is only their children who turn their back on the past and push further into Eden. Two of the main themes of the book is how even the best of intentions can turn to ash in your hand and whether humanity can leave the worst of itself behind when it reaches for the stars. The world building is partially strong. Burke has had to anthropomorphize both the Glassmakers and the plants to a certain degree and this is understandable. Had the various creatures, that the generations met, been truly alien then the chance of communication and cooperation would have been limited. The book opens up the ecology of the planet with its wonders, highly sentient plants and the mystery of the Glassmakers, a race which has built a city but has disappeared. Burke writes with confidence and I read the book in a single sitting as each of the stories wove into the next to create a compelling whole.